The chase continues! Cornered in a warehouse, Catwoman listens to Ivy explain how similar their motives are, and that the two of them should work together. But if Ivy’s not paying, Catwoman is not interested. As the fight between Harley, Ivy and Catwoman renews, Batgirl appears. Meanwhile, Montoya interviews Dr. Schneider and discovers he may have been manipulated by Poison Ivy in the first place. Back at the warehouse, Batgirl gets the poison and takes the fight outside. The other three give chase. After a rooftop scuffle, Ivy explains to Batgirl how dangerous the stolen chemical is, not only to humans but also to all life, and pleads for Batgirl to return it to her. Batgirl doesn’t buy it, and runs. Soon, she finds that Ivy and Harley have herded her into Robinson Park, where Ivy reigns supreme. If the first issue was more than 50% chase scene, this one tops out around 90%. Whoo-boy. I suspect this story is best read in its entirety, not in chapters. Ivy did deliver two monologues, which was interesting, but the story hadn’t advanced an inch by the last page. Still slightly on the cartoony side of things, but enjoyable. There are a couple of particular nice Harley panels. And when Ivy monologues her back-story, it was fun to see parts of her BTAS origin done in TNBA style. This could take place just about anytime after the appearance of Batgirl and Montoya’s promotion to Detective. 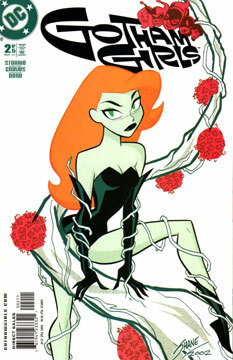 As a customizer, I’m sort of interested in a TNBA Pamela Isley. Guess I should make a BTAS version first. If you’re in for one, you’re in for all.